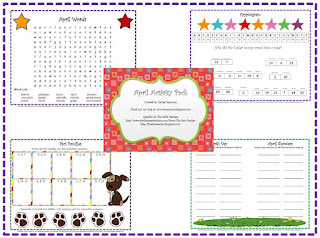 A - B - Seymour: Chapter Book, April Activity Pack, and a Freebie!! 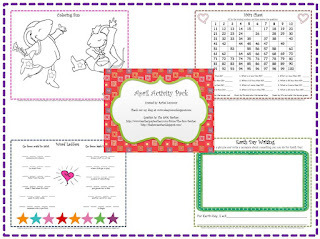 Chapter Book, April Activity Pack, and a Freebie!! I read a chapter book to my kiddos every afternoon, as I'm sure many of you do too! Well, I was out on Friday (BOO to allergies and asthma!!) so on Thursday we finished chapter 8 of a mystery chapter book we have been reading....there were 10 chapters in the book. I usually only read one chapter a day because they can be kinda long. Well, we were about to solve the mystery at the end of chapter 8 and my kiddos wanted me to keep reading!! It was so exciting to see them wanting me to finish the book so they could know what was going to happen. I first told them they would have to wait until Monday, when I would be back, to finish because I wanted to know what was going to happen too! This did not go over well! Yay!!!! :) So, instead I told them that if they were quiet, and well behaved, and worked hard the rest of the afternoon we had time we would finish the book at the end of the day. All afternoon, I was kindly reminded that we were going to finish our chapter book. I try to instill a love of reading in all of my kiddos and it doesn't always happen, but I try! Last Thursday, it worked! I was so happy to see them hooked by this book. It probably helped that it was a mystery and had a dinosaur in it.....but, all that matters to me is that my kiddos loved it! That was a good day! Now, onto my April Activity Pack. I give my kiddos an activity pack every month. They are allowed to work in it when they have finished all of their other work, or when I need to work with a couple of my kiddos, or when we have a sub. I try to include a variety of activities so that all of my kiddos find something they like and can do independently. This time I decided to create my own! 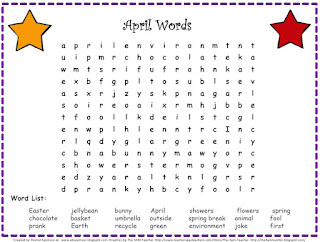 I have included a Word Search, Word Ladder, Cryptogram, Fact Families, Hundreds Chart, Earth Day Writing, Spring Writing, Coloring Page, Story Problems, Word Mining, Glyph, and a Word Scramble. It is available at my TpT store! There are pics below to show you what's included. Thanks to Michelle at 3AM Teacher for all of the wonderful graphics!! 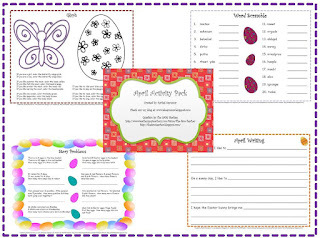 And, since I'm still a newbie at blogging, I've decided to give 10 April Activity Packs away to my first 10 followers who grab my button, follow me on TpT, and leave me a comment with your email address!! I have also decided to give my Word Search page away for free! Hope everyone has a great week! I'm looking forward to seeing my kiddos tomorrow....I miss them when I'm gone! I am so glad I discovered your blog! I grabbed your button and of course follow you on TPT! Yay!! I have grabbed your button, and I follow you on TPT!! Doesn't it feel great when kids beg you to keep reading? What book were they so into? My kids got that way a lot with Magic Tree House and The Boxcar Children! I like the idea of giving them a packet to work on when they finish! Great thinking! They look terrific too. I'd love to win one. Also you can visit my blog I have lots of freebies that may or may not fit your needs. I also will share your blog on mine, and maybe you can get a few more friends. .. Ha ha! Not that I have that many, but us newbies need to stick together! I added you to my blog roll and am following you on TPT! Jenny- It was A to Z Mystery: Talking to T.Rex. They loved it...my boys and my girls! I cant grab the button because I dont have my own blog....yet! But I follow you on tpt. HI! Thanks for commenting on my blog! I am now a new follower of your blog! Come on over and check out my TpT store too! !